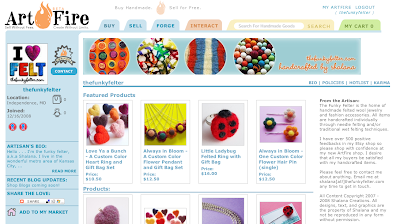 The Funky Felter: I've taken the plunge and joined ArtFire! Have you? I've taken the plunge and joined ArtFire! Have you? After reading many good things about ArtFire, a new community for selling handmade items, I decided to take the plunge and purchase a shop there. (You can visit it by clicking here.) For a limited time and number of shops, the monthly fee is only 7 bucks! And, there's no listing fees or commission rates to deal with either. It is just a flat fee for as many items as you want to list. There's also a great free option which limits the number of items listed though. I've been on ArtFire for less than a week now, but so far, I really like the site. First of all, as I mentioned above, it is a low start up cost. Also, I'm impressed with the fact that they are doing online and print advertising. I recently saw an ad for ArtFire on the back cover of CRAFT Magazine, and I've read that ArtFire has purchased several more back cover ads on CRAFT. Item listing is only a one page process! It is also well formatted and easy to use. The staff there has been quick to address bugs and new upgrades that are in the works. I can't stress this enough so I'll say it again - only $7/month! No other fees! Your new item automatically shows on the front page when it is listed! New items rotate on to the front page as they are listed. The community is growing quickly considering the site is very, very new. It is nice to get in on the ground floor. Even though it has some glitches to work out, the site design is lovely and very easy to navigate and set up shop. There are multiple payment options including PayPal, GoogleCheckout, and RME. I've sold on a lot of sites over the last couple of years with my only really good success being my Etsy shop. I have a very good feeling about my ArtFire shop though. As it grows, I think that ArtFire will become very popular. It has some similar online selling features as Etsy, but it is certainly no copycat, and I like that too. ArtFire is uniquely its own! If you have an ArtFire shop, I'd love, love, love to know your shop address and what you think about the site so far so PLEASE leave a comment. Also, if you don't have a shop yet, but are thinking about signing up, I recommend that you take the plunge for just 7 bucks a month. And, I would appreciate it, if you would use the link below to register so that I can be your referral. Just click on the link below to check out the site further and see about registering to sell. Alright, I signed up, using your link. My shop is http://Brookberrys.artfire.com. I did the free account for now and I haven't listed anything yet, probably won't until after New Years. I signed up using your link too. I'll list a few things today and add more after the holidays. Thanks for sharing it! Got in early enough to actually get the name oh wow. That doesn't happen too often. ps. When you drop stuff by again in Jan - add rings to my wish list. I joined but have only listed one item there. I've joined but only the free account for now, until I see how things settle out. I joined last summer when they were just going into beta, but only started listing items last month. I have a free shop for now. For those of you joining us, welcome to ArtFire. We really appreciate you adding your creative voice to the ArtFire community. I look forward to hearing everyone's input as to how to make this site better for you and your buyers. I took the plunge and registered for the $7 membership. I didn't use your link (shame on me but I clicked through before seeing your link)but I did put your name down as a referral. Hi - Just joined via your link. Starting with a FREE account for now. Thanks for the info & the encouragement. Congrats on your joyful news!!! I just took the plunge. It may be a few days before I get anything listed. I joined recently and am still trying to find my way. I am confident that this will work and also like the fast response to emails when there are problems. How are your sales on this site?